Lego City Square is a fantastic set to build your city around. It contains a handful of separate buildings and vehicles, all of which look great with some excellent visual appeal. The tram and the car showroom are personal favorites here, but everything included will fit right in with your Lego City. 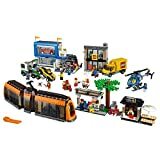 These include Lego Shop, coffee shop, helicopter, scooter, tow truck, tram stop, Lego delivery truck, hot dog stand, and newsstand. Phew, that’s a lot of content. This set works as a fun collection of minor additions to an existing Lego city, or as a great base to begin a city. City Square Square is currently available on both Amazon and the Lego Shop as of the time of this writing and below MSRP. We don’t expect this to last very long, however, as once word spreads of a retiring Lego set, especially a high-quality one like this, they tend to sell quickly. City is one of the oldest lines in Lego’s history. The sets are constantly being rotated to make room for new ones. City Square has had over a two-year run after making its initial appearance in May 2015. While there are constantly new City sets coming out, it is sad to see such a great, wide spanning set like this sent to retirement. City veterans and those looking to start a new City built on their own would be wise to grab this one before it is gone. It’s buzzing with activity at the City Square! Park your bike at the cozy coffee bar, hop aboard the awesome news helicopter and take to the skies for a bird’s-eye view. When you’re done flying, call the LEGO® Store where a new delivery has just arrived. Help the driver unload the boxes, place them on the handcart and wheel them into the store. Then check out the cool cars for sale at the dealership showrooms. Help the mechanic operate the car lift and fit a new set of sporty alloy rims. There’s just time to buy a hotdog and a newspaper for the journey home, but watch out for the pizza deliveryman on his speedy scooter as you head for the tram stop! Load your bike into the bike compartment, take a seat and watch the world go by as you travel through the LEGO City streets. What an exciting day! Includes 12 minifigures with assorted accessories: a tram driver, helicopter pilot, coffee shop saleswoman, pizza deliveryman, car saleswoman, mechanic, tow truck driver, hotdog salesman, LEGO sales person, LEGO delivery driver, a girl and a boy. Also, includes 2 LEGO store statues. Includes 12 minifigures with assorted accessories: a tram driver, helicopter pilot, coffee bar saleswoman, pizza deliveryman, car saleswoman, mechanic, tow truck driver, hotdog salesman, 2 LEGO sales personnel, a girl, and a boy. Check out the latest sets at the LEGO Store!